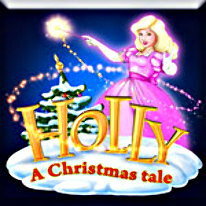 Prepare for a journey of wonder in Holly: A Christmas Tale! Bright, colorful and bursting with holiday magic, A Christmas Tale tells the story of Holly, a young woman who nods off on Christmas Eve and dreams about helping Santa Claus deliver toys to children around the world. But is she really asleep? And what about the magic wand she's using? Does it hint at a greater destiny for Holly?